Blurb: St. Vladimir's Academy isn't just any boarding school it's a hidden place where vampires are educated in the ways of magic and half-human teens train to protect them. Rose Hathaway is a Dhampir, a bodyguard for her best friend Lissa, a Moroi Vampire Princess. They've been on the run, but now they're being dragged back to St. Vladimir's the very place where they're most in danger. . . .
Rose and Lissa become enmeshed in forbidden romance, the Academy's ruthless social scene, and unspeakable nighttime rituals. But they must be careful lest the Strigoi the world's fiercest and most dangerous vampires make Lissa one of them forever. Review: Wowwww...This book was just WOW!! I know I’m a bit late at starting this series and for a long time I’ve seen reviews and I kept saying to myself, “I have to get this soon,” and then my opportunity came. I got the first three novels in a box set for just €3.00 which was amazing!! And let me just say that I am so happy for that box set being available! Lissa is a vampire princess who needs to be protected at all costs and Rose is her unofficial dhampir guardian, half human/half vampire. They’ve been on the run for two years but are dragged back to St. Vladimir’s Academy. But it isn’t a normal school. It teaches vampires all they need to know about magic and teaches dhampirs how to protect them. Lissa used to be the queen of the school but Mia has taken over and she won’t give up the title easily. Rose is having problems of her own when vicious rumours start to surface. But there are bigger things happening. Someone knows Lissa’s secret and she isn’t safe. Not even at the academy. What, may you ask, makes this book so special?? EVERYTHING!! It’s exciting, interesting, unique, it has hot characters, an addictive storyline and there is lots of drama. I loved this book from the beginning to the end. I LOVE the idea Richelle has created in this book and it’s different from The House of Night series (another well known vampire school series). I can see why people compared Half-Blood by Jennifer L. Armentrout to this because they are so alike. I think maybe Jennifer got some of her idea from this. The main characters, Lissa and Rose, have been on the run for two years (Alex and her mother for three), then they get taken back by the guardians (Alex by the Pures at the school), Rose has one last chance to prove that she is worthy of staying at the school (same for Alex), Rose gets the HOTTEST trainer ever (Alex gets one too), and there are so many more things similar I can’t write them all down. But both novels were amazing. Rose is an amazing character who I loved. She is extremely funny and snarky and she adds a lot of humour to this story. She has a lot of loyalty to Lissa and will do almost anything to protect her. And they’re best friends. Lissa was another great main character but I preferred rose, mainly because it was her POV we were reading from. But Lissa was good because she was unpredictable and was very kind, sweet and loving. But she was also a complex character because she had a dark side that I won’t say much about. Now for a small paragraph about the amazing Dimitri who I fell in love with. I have a HUGE book crush on him now and he’s just...yummy in all senses of the word. He’s got an awesome body, he’s Russian, sensitive, wants to protect Rose and kills vampires. What isn’t to love about him? He is so swoon-worthy and if you read this you’ll fall head over heels for him. I can’t wait to read more about him. I don’t really have any problems with this book. Maybe they could have edited it a bit better as there were a few typo-errors and I would have liked a bit more of Dimitri in it but there is the rest of the series for that. 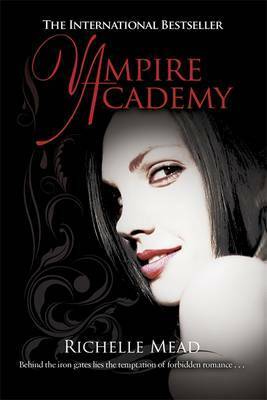 Vampire Academy is that type of book that you just can’t get enough of and it keeps hold of you until the very end. It had characters I loved, hated and cared about, romance, humour, suspense and lots of twists near the end of the book. I am looking forward to reading the second one next!